Now the auction is fading in to the distance the bidders are reflecting on what they have spent and how much extra it will cost to ship the Donkey Wheel, I think it's worth refelecting on what happened last weekend. 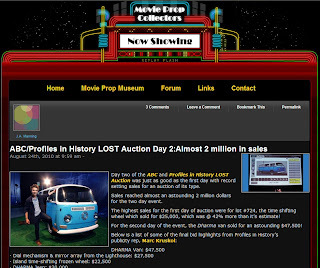 The Movie Prop Collectors Website has a brief look back at the auction as well as a video of some of the highlights of the day, you can watch that video below. For me the first day of the auction was spent following all our favourite Losties on Twitter as well as via email and blogs to see what was going on. We posted a lot of pictures on the Day 1 and Day 2 LOSTARGs blog posts. I missed the first few bids as I was at a family party, but when I got back and saw what was happening I was literally lost for words with some of the prices of items already sold. I stayed up until around 5am in the UK for that first day with things still in full swing. Getting up the next morning and reflecting on the prices meant I knew I was almost out of my league for most items. Especially when two DHARMA beer cans went for $1500. Day 2 started with more of the same, people viewing the exhibits and getting into the general lostness of it all. I think that is one of the things the the auction got absolutely right, to open as an exhibit for fans and provide more than just a warehouse with chairs. In amongst all the auction and exhibit excitement we were given a bit more drama to watch as Dave Rambo travelled across America to be there, and there was a collective cheer when he arrived and we got a picture of him at the auction (see Day 1 post). 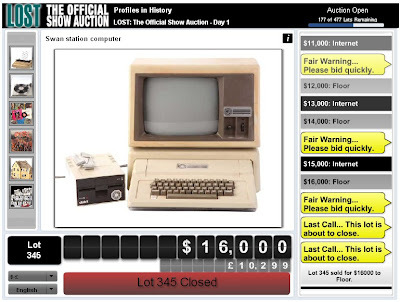 During day 2 of the auction I joined several losties in a Skype call and we talked about the auction and we listened as some of us bid for lots and even won one or two. I couldn't stay up for the entire night so I got a couple of hours sleep. However on getting up I saw the auction was still in full swing, so I sat back down to watch the bids rack up huge winning totals again. I'll remember the whole 2 days because it gave the LOST Community maybe a last chance to collectively be involved in the show and share memories, bidding victories and our passion for LOST. Unfortunately we now get to the wrongs of the auction, first we had the complete debarcle about the conditions of registration for the event, and the conditions of entry. First Profiles In History required a $500 deposit, then we didn't have to make that deposit, incidentally the auction conditions on the Live Auctioneers website still mentioned this $500 deposit on the day of sale. Along side the bidding conditions the criteria for entering the exhibit were even more confused and even now I'm still not 100% clear what was required to enter. 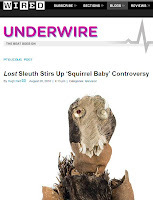 While we are talking about before the auction I have to mention the squirrel baby controversy, this was documented on Prop blogs (including ThePropBlog.com) and even the Wired Magazine website. Still all of that was before the auction and we didn't need to worry about it when the auction got under way as we were all informed and knew what was happening. 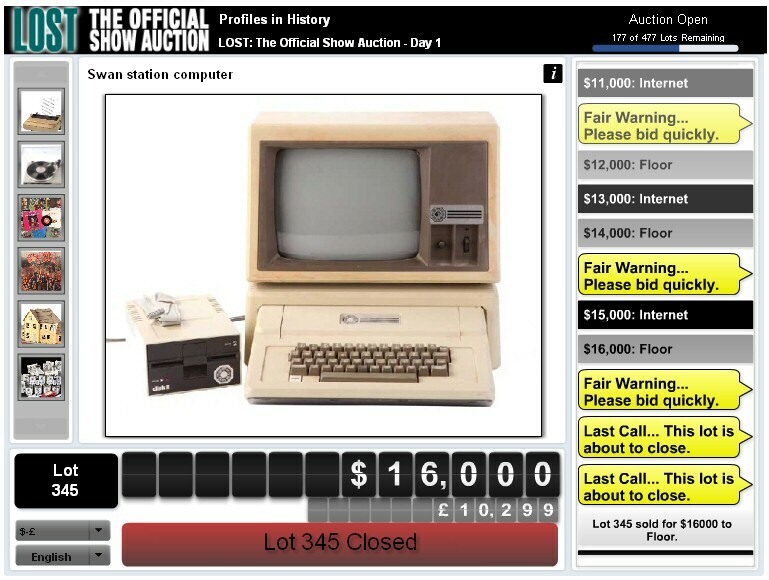 Wrong, just after lot 1105 was sold we got this message on the screen, to say the Live Auctioneers online bidding system has a twelve hour limit and that only on the floor bids or telephone bids would be allowed. At that point I was interested in a couple of items that were coming up so tried to call the number on screen, I could not get through, I tried several times but got no response dialling from the UK. Then the message changed to say that all absentee bids were cancelled. Probably a bit too late as all absentee bids were more than likely made by people that were not going to be watching the auction ! Yes I know the terms and conditions say that absentee bids are not guaranteed to be placed, but to disreagard all absentee bids from that point on is really a bit of a joke in my opinnion. So we are at the end of the auction, I couldn't bid on a few items, although I did want to and might have got them if I was given the chance. We have computer problems all the time so I wasn't too upset. 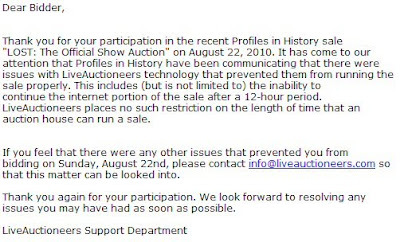 Until of course this email from Live Auctioneers arrived to all online registered bidders. This completely contradicts what Profiles In History are saying, and when I emailed PIH I got a reply to say "...we were told there was a 12-hour limit per sessions. 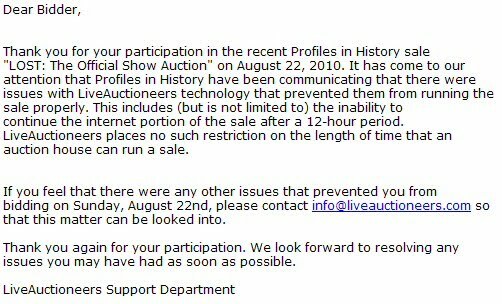 After 12 hours the data is no longer recorded..."
I have asked both Live Auctioneers and Profiles in History for further comment as both are saying the opposite thing, however neither company has decided to reply to that request. So is this just another island mystery that will never be resolved, was there something wrong with the system and internet / absentee bids were not being recorded correctly ? We may never know, but if you feel strongly about what happened I suggest you contact Profiles in History and Live Auctioneers to see if they will decide on a response together and not simply blame each other alone like a school yard spat. I will be happy to post any joint response they may here if they decide to make one. Regardless of the bidding problem at the end, my overidding memory of the auction will be one of a final shot of camaraderie with the people I have grown to know and respect over the last 6 years, and I will always be grateful to LOST for the best shared TV experience I have ever known. Zort said..."my overidding memory of the auction will be one of a final shot of camaraderie with the people I have grown to know and respect over the last 6 years, and I will always be grateful to LOST for the best shared TV experience I have ever known"
ChrisL said... Could not agree more and much of that camaraderie came about through this excellent blog Zort. For that, thanks due to you. Very well said, Zort! You summed up the Lost Auction perfectly. People thought I was crazy sitting at an auction for almost two full days and not bid on anything. But it was much more than that. I got great "photo ops" with some of the props, I got my souvenir catalog signed by the actors and the Prop Master, I took some great pics of everything, and, most importantly, spending time at an official Lost event with new and old Lostie friends. I even got to host Jo and Lisa overnight!! I feel the people I've meet here (and originally on TLC) and FB will forever be my friends!! It has been a recurring joke with me planning to attend a LOST event, only to back out in the end (Comic-Con, Gallery 1988, Sunset Premiere, LOST Live...) So, finally being able to make the trip, meet fellow fans and participate in the auction were all things I will never forget. I enjoyed every moment of it. I hope "12 hour"-gate doesn't spoil the entire event for people, because it was much more than an auction anyway. People seem to harbor a lot of resentment towards PiH, even before the auction, but I am grateful for all the work they put in. I never in a million years thought I would be given the chance to own something from LOST. Dream come true, for sure. - Taylor's "The Smoke Monster"
- Danger's "...today is the first time i've ever come back". I'm selling them for less than the six months average price they have on Expressobeans. My email's on my profile, if you are interested in any (or more than one) of them. 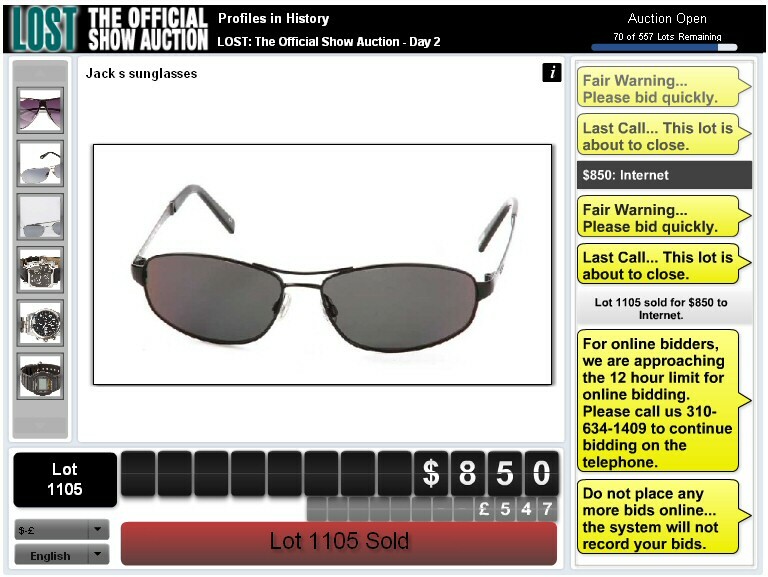 I watched both of the auctions and was stonished by the ending prices. I think that those who had the money bid on many things at once never giving the poor folk a chance. 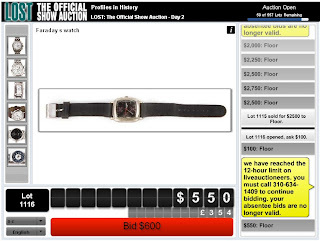 I stayed up until 4am my time to bid on Juliets watch and wound up being outbid by thousands of dollars. WTH??? Anyway, not happy with how things went and that wasn't a cap as to how much can be spent and who can bid. I hear Damon bought the pilot. Does he not have a gillion copies? 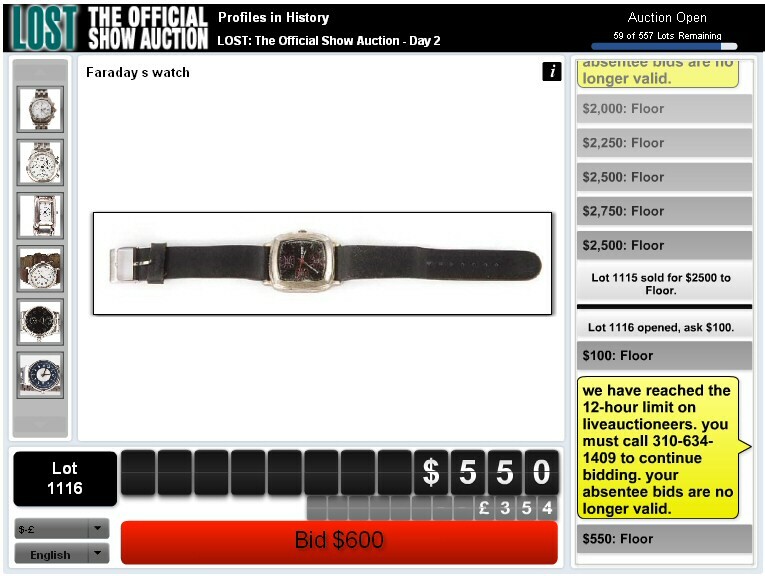 The most frustrating part about being on the floor was not knowing where the Internet bids were coming from. Like Rockharpered said, it was discouraging thinking that one billionaire LOST fan could buy up everything, but every so often someone in the room would win something and restore my confidence. I sat on my paddle for nearly 18 hours before finally bidding, and once I did I was able to snag my "holy grail". Even the individuals on the floor buying up plane parts met there limit eventually, so I am hoping no one online was building a personal LOST museum. But only PiH will know for sure. However, I have already traced a few big-ticket items back to average Joes/Janes...which reassures me somewhat. These props need to go to loving homes. Excellent post and event coverage as usual Zort! Thanks for keeping our community together as long as humanly possible as well. Thanks zort for the excellent work you have done here. There were a few winning bids that surprised like the donkey wheel but for the most part I wasn't surprised. 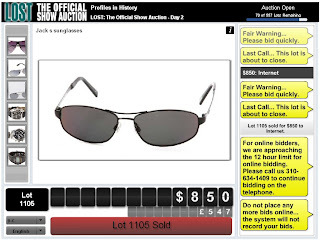 This was a collectors auction and collectors have deep pockets. It's a shame it wasn't run a little more smoothly though. Last post on theislandisntdonewithyouyet.com is up! RockHarpered said: I hear Damon bought the pilot. Does he not have a gillion copies? Damon tweeted a joke...he did not buy the pilot script. He said: "I can't believe I spent $14,999 for JJ's signature." Echo ChisL's sentiments about Zort's comment about this little community with a big heart. Whether it be a flash forward, flashback, or flash sideways... the last year with you all everybody will be one to remember. Show, auction, ARG's may be over, and things may be winding down on this side of the island, but with a BIG smile on my face... I think I can let go now knowing that you're all still out there whether be it in NH, the West Coast, overseas, or another part of the good old US of A.
Oh, def not over yet. Emmy Awards tonight! Special occasion calls for a margarita while watching. Hi all- have, been out of computer range the last few days-but I did check in live on day 2 to see the Panda Bear going for 3K or so. Yeesh! I told my brother about the duplicates for most props, and he said he could get me one at Sears if I wanted, for a bit less. When I get back to home base I will browse through your record of the mayhem Zort- looks like it was fun still- well we make our own fun don't we? I remember being online last year when ME won the Emmy- and everyone stopped to say hooray. Hope there will be some tonight for Lost- I will imagine you all cheering too! Congrats to anyone who scored an item from the auction! I didn't even bother when I saw how complicated it was getting, but I'm happy I at least picked up a catalogue! I have a question to the art collectors out there - does anyone know the proper way to store prints? I've run out of wall space, but I do not intend on selling anything either. If anyone can help please let me know! Ben, you need to look for a presentation case. Here's a link to provide more info. If you are overseas...you, no doubt, will find a better deal locally (no shipping chrgs). Sorry, I was distracted by TV...watching Emmy red carpet stuff.